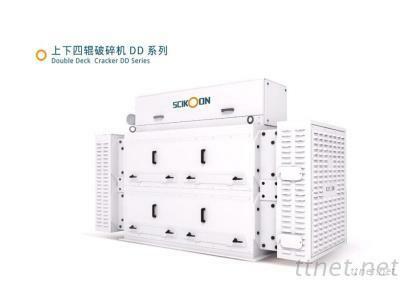 - Compact installation, high capacity, low power consumption. - Toothed feed roller, feeding uniformly and smoothly. - Effective crushing, lower powder. - pneumatic-controlled strobe controls material flow easily. - High quailty chilled alloy rolls. - Spring-loaded rools protection device. - Synchronous roll-space adjusting mechanism to ensure roll in parellel. - Analing gauge hand-wheel, adjust roll gap distance precisely. - Excellent frive and belt tension device, optimal drive efficiency. - Optional different roll teeth to meet different applications.